I'm fascinated by fast food. I don't eat much of it, except for the occasional McDonald's meal on I95, but I'm still really interested in the history of fast food: the "where, who and why" of it all. From the Harvey Girls who made waiting tables into a real career on the railroad lines, to Duncan Hines and his drives across the country discovering hole-in-the-wall restaurants, to Burger King, Wendy's and Fat Burger -- behind every fast food joint there is usually a great American story. Fast Food: Roadside Restaurants in the Automobile Age is a wonderfully readable book on the history of roadside restaurants, and it offers quite a bit of background on fast food culture, including one of my all-time favorite restaurants: Friendly's. For those of us who grew up in suburban New York or anywhere in New England, Friendly's is an important landmark. It's where you went with your friends after a movie, or where your parents took you after a school play or concert. Friendly's is where I experienced my first real stomach ache (Jim Dandy? I don't think so...) and where I learned that I do indeed have a delicate constitution. Regardless of all that, I can't get over the feeling of nostalgia that warms over me when I walk into a Friendly's restaurant. 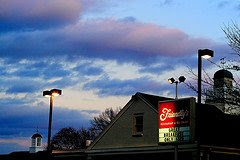 According to the book, Friendly's originated in Springfield, Massachusetts in 1935 as a dairy and soda shop. They shut down during the war due to gasoline rationing which cut automobile traveling, but opened up again afterwards, serving ice cream throughout Massachusetts. In the 1950s Friendly's expanded to upstate New York, Philadelphia, Baltimore, Washington, D.C and even to parts of Indiana and Ohio, but still remained an ice cream-only destination. It was only in the 1980s that Friendly's began to serve food. 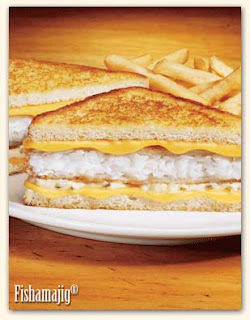 And speaking of food, while my love for Friendly's is vast, my heart belongs to the Fishamajig. A little background before you think I'm crazy. I grew up in a kosher home. We didn't eat out much, and when we did it was to a deli or Moshe Peking or Pizza Hut. However, we did love a good Friendly's meal. Besides ice cream though, the only thing we were allowed to order was a Fishamajig. The Fishamajig is essentially a grilled cheese sandwich with fried fish and tarter sauce in the middle. A bit like the Filet-O-Fish, yet probably less healthy (if that's even possible) and I'm guessing just as non-kosher. I had one this past weekend, and while I did feel a tad sickly afterwards, it was worth the pain. It was a sublime Fishamajig. For those of you who haven't tried a Fishamajig yet, I wouldn't necessarily recommend it. It's kind of an acquired taste. But should you desire to peruse a menu to see your other options, we have one in the Library's Menu Collection. I should know - I put it there myself. ...and if they put a friendly's on 7th ave? GAME. OVER. Dinner and a movie in high school invariably meant Friendly's and the MultiPlex. Unfortunately, the former often meant missing the second half-hour or so of the latter. Those Fishamajigs, as we know, are cooked on the same grill as the Patty Melts -- a Hillel Sandwich it's not. And you're right: with 660 calories, 39 grams of fat and 1570 mg of sodium, it knocks the Filet-O-Fish out of the water (F-O-F has 380, 18, and 660, respectively). But then a Fishamajig is twice the size, and uses much tastier cod versus McDonald's pollock. I LOVE Jakle's book Fast Food. And if your interest in the culture of road trips goes beyond just the food, I'd also recommend The Motel in America by the same author. It's a great behind-the-scenes look at how roadside motels came to be such a big part of the American landscape. The Clements Library has a some great Duncan Hines ephemera, unfortunately not digitized. But the Kentucky library has a Duncan Hines exhibit online. Fishamajig -- what a great name! I'm with you; I don't care much for eating fast food (except for onion rings...) but the Americana aspect is fascinating. I've put the book on my reading list. I hope that the reference in the original post to Friendly's being a ice-cream only destination until the 80's is a typo. Where I grew up in Pittsfield MA in the 60's, there were no less than 5 Friendly restaurants serving burgers and fries along with the fabulous Fribble thick milkshake. The Fribble was originally called the Awful-Awful with the tagline "awfully-awfully good". I can't imagine why they changed the name. They made the burgers from a setup where the lettuce tomato cheese and mayo was made like a grilled cheese alongside the cooking burger and the burger slipped in at the end. YUM1 They discontinued that practice when Borden's bought them out in the 80's. IMHO the menu and the taste went way downhill due to corporate meddling and now there is only one Friendly's left in Pittsfield. I remember Friendly's as a child, but just the Fishamajig name makes me smile! I need to finda Friendly's so I can try this. I started working at Friendly's in 1979, and they were more than just an ice cream shop. Big Beefs, Fishamajigs, Clam Rolls, Fishamajigs and ice cream were their big sellers. By the late 80s they were adding microwave rice pilaf and other atrocities to their menu, by the 90s they were adding quesadillas and things that made no sense. They should have stuck with what they did well. I was eating fishamajigs in the early 1970s.